Croatian jurist and ex-President Ivo Josipovic told BIRN that a Zagreb court’s decision to reduce the prison sentence given to former Croatian Defence Council officer Marko Radic does not reflect the gravity of his crime. The court in October cut Radic’s sentence for committing crimes against humanity against Bosniaks in the Mostar area of Bosnia and Herzegovina because the Croatian legal system does not recognise the concept of a ‘joint criminal enterprise’. The Zagreb ruling amended a verdict delivered by the Bosnian state court in Sarajevo, which originally convicted Radic in March 2011. The Zagreb court agreed to take over the execution of the Bosnian court’s judgment after the Bosnian justice ministry permitted Radic to serve his sentence in Croatia. 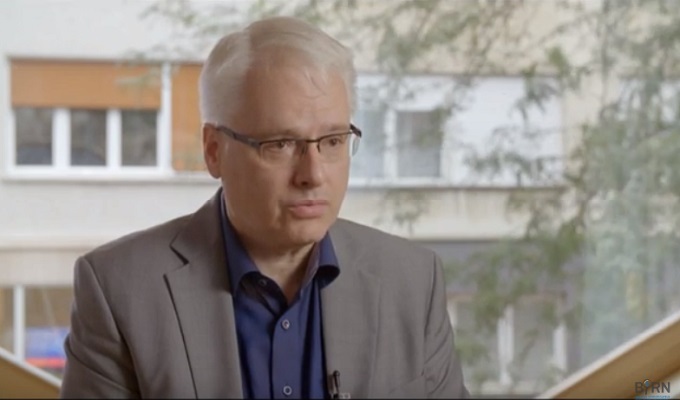 “I personally consider that the crimes which the Zagreb County Court accepted as grounds for continuing the execution of the sentence in Croatia are so grave that the newly determined sentence is insufficient and disproportionate to the gravity of the crime,” Josipovic told BIRN. “The comparison made by the court to sentences pronounced by Croatian courts under some other judgments seems problematic because the penalty level is not only determined by the legal description of the crime, but also, to a significant extent, by the factual description of the crime,” he added. The Sarajevo verdict convicting Radic named him as a participant in a joint criminal enterprise. But Josipovic said that the absence of an equivalent concept in Croatian legislation should have been explained in more detail in the Zagreb verdict. “I am of the view that the County Court in Zagreb should have provided a detailed explanation of its assertion concerning the non-existence of an equivalent status of guilt for the described crimes in the Croatian laws, instead of laconically stating that there is none,” Josipovic argued. “Even more so due to the fact that there are three forms of so-called joint criminal enterprise, two of which, beyond all doubt, can be subsumed under the provisions of Croatian criminal legislation concerning guilt for complicity in a crime and the responsibility of commanders for crimes committed by their subordinates,” he added. He noted that Croatian courts, when handing down sentences to Croatian nationals who fought in the 1991-95 ‘Homeland War’, are given lighter sentence because participating in the country’s defence is considered a mitigating circumstance, but said this does not apply in the Radic case. “In the case of the accused M.R. [Marko Radic], when it comes to the Republic of Croatia, such a circumstance, as far as it is known, does not exist,” he said. The Bosnian state court’s verdict found that Radic, as commander of the First Bijelo Polje Battalion of the Croatian Defence Council’s Second Brigade, participated in setting up prisons and ordering the arrest and unlawful detention of several dozen Bosniak civilians, including women, children and elderly people. The verdict also said that he participated in the unlawful detention of Bosniak men at the Heliodrom prison camp. The men were taken to the village of Vojno to do forced labour and kept in brutal, humiliating and inhumane conditions in a garage and the basement of a house in the village. After he was convicted in Sarajevo, Radic’s request to serve his sentence in Croatia instead of Bosnia and Herzegovina was granted. But the decision to grant the request, which was made by Bosnian Justice Minister Josip Grubesa, sparked outrage among Bosniak politicians. Radic, who was due to remain in prison until 2027, will now be released by the end of this year because of the time he has already served.